Yet, the purpose of a ‘government of the people’ is to serve the best interests of all citizens. Citizens living and working together represent a ‘community’. Within any community a variety of interests exist. Though we like to think of the melting pot as a collaborative effort; in cases of competing interests, interests that are mutually exclusive, there is a sense some people will always be served better than others. In some cases even the desires of the majority are denied. That is not to say special interests always have an inside track; but, to some extent, responsible decisions are boring and disappointing to the majority. So it is even in your personal life. Good health and happiness result from effective self-governance. Sure, there are some people who consider exercise, nutritional food, sleep and personal safety to arise from some sort of ‘good health’ tyranny. A contrasting perspective is that positive health habits are symbolic of freedom; that we accommodate and adapt to ‘regulatory’ restrictions and mandates because we know they are in our best interests. 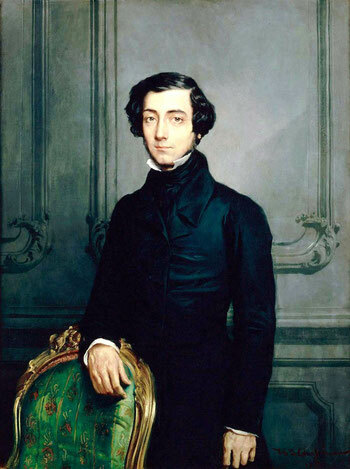 Tocqueville’s concern about the demise of community arose from a sense that after being voted into office politicians might act in their own best interests first, and that a non-participating citizenry would allow them to get away with it. In such a circumstance the sense of community erodes as no one’s needs are met or citizens’ best interests are not served. Likewise the health and well-being of any person who lacks knowledge and discernment. If not regulated, the fear and pleasure centers of the brain default to enjoyable but unhealthy choices. The long term consequences of which are dis-ease of mind, body and spirit; the community of being. For example, Smoking holds great promise and is ‘voted in’. You ignore what Smoking is doing in office until health problems appear. By then your body has adapted and, despite being against its best interests, re-elects Smoking over and over. The tyranny of Smoking is that if and when it imposes life-threatening disease, it cannot be impeached. As with any tyranny, by the time the community realizes the disastrous consequences of their choice, it can no longer stop it because it subsequently sacrificed its participation role. That was Tocqueville’s concern, but American democracy has remained vital and strong because citizens still participate; also because politicians have largely looked out for the best interests of Americans as a national community. Yes, both politicians and citizens have make mistakes over the past couple centuries. There is a human tendency to seek self-interest. But the strength of the majority, in both the government and the population, is that the best interests of the country remain foremost. Health tyranny takes many forms; overeating, lack of exercise, poor communication, anger, risk-taking, etc. Some are elected. Others stage a coup. True freedom is when you make choices to take control back for yourself, to regain good health and happiness. Independence is when you do so with the certainty that you are acting in your best interest.